Ever since I had my baby in June there are a few pavements I’ve trodden frequently and those that run through our local park are some of them! Yesterday, I was walking through the park and reflecting on how things have changed there in the last 5 months. On my very first walk around the park with my daughter, I was in sandals and t-shirt enjoying the sunshine of summer. Yesterday I had donned my winter boots for the first time! As a wandered I began to reflect upon the seasons. One thing I love about living in England is that we truly get to enjoy the seasons. Ever changing. Ever showing us the beauty of God’s creation. We know with certainty that in spring the blossom will bloom, we hold out for the possibility of one week of hot weather in July, October brings the colours of autumn and you know there’ll always be the frost of winter, with of without a flurry of snow. Yesterday I was captured again by the beautiful autumnal colours – fiery oranges, deep reds and vibrant yellows. 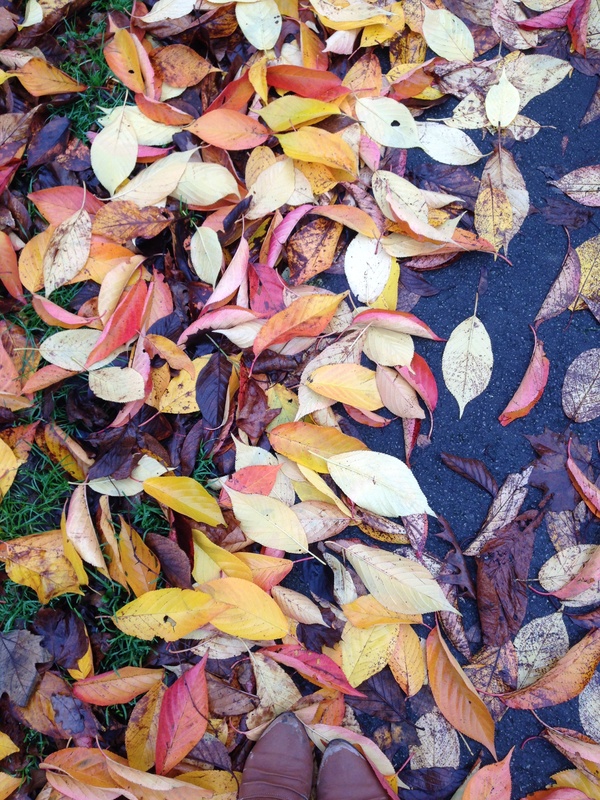 The sounds of autumn – the crunch of leaves beneath my feet. And as I walked God reminded me of the changing seasons and the way the seasons bring life and death. 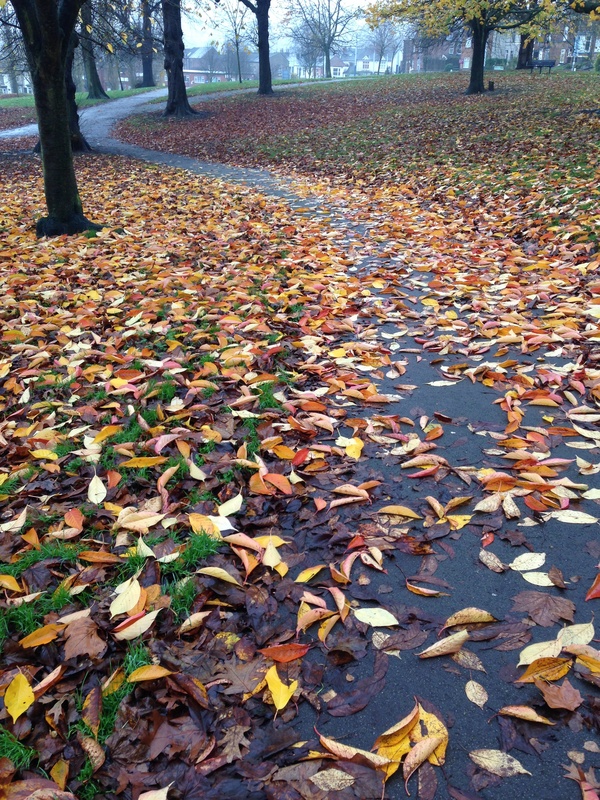 I only had to look at the fallen leaves. And rather than feeling sad that the leaves were falling and the dark of winter was coming I was reminded of BEAUTY and HOPE. Death is hard. But allowing the leaves to fall brings BEAUTY and HOPE. Yes, even in death there is beauty. You only need to look at the falling leaves to see how rich and good God is even in death. He takes the green leaves of spring and creates for me an array of autumn colour, beauty and joy. In times that feel like death in our lives I am certain that God always has the power and grace to bring beauty. Secondly, we know that soon the spring will come. Our Nana is an incredibly positive lady. When talking the other day of the winter drawing in, rather than speaking of the difficulties the cold and darker weather brings to a 93 year old, she remarked positively that it meant spring was around the corner! What inspiration. When I think of Jesus, I wonder how incredibly hard it must have been to embrace death, real death, on a cross. The death I experience in my life isn’t half as scary or confusing. Yet Jesus knew that without death there could not be life. Without the falling of the leaves in autumn and the burial of the leaves in winter we could not have the joy of the spring and the life that waits expectantly for us. Today, I ponder on where in my life I am experiencing death. Which parts of my life have to die and fall to the ground? In that place, what’s the beauty that God’s revealing to me? And through it all do I have hope that Spring is not far away? Whether you feel like you’re in a season of life or death right now, I challenge you to look for the beauty and hold onto the hope held out to you in Jesus. I like all the “S” details about the colours of autumn leaves. Congratulations on birth of your little girl and every blessing to you and your family as you get ready for Christmas time, you are all wonderful people.